I found Sweet Potato Pone, and just had to give it a try. The pone looked plainer than many sweet potato dishes; but it was lovely, with a sweet, ginger flavor and citrus undertones. It had an almost pudding-like quality. Wash the orange. Using a grater, grate the orange rind. Set the grated rind aside. Cut the orange in half and squeeze the juice; set the juice aside. Preheat oven to 350° F. Combine the butter and sugar in a mixing bowl. Beat until creamy, and then add the remaining ingredients and beat until the mixture is smooth. Put into a casserole dish, and place in the oven. Bake for 1 hour. I’m not sure why this recipe is called a pone. According to the dictionary pone is a type of cornbread, but this recipe doesn’t call for any cornmeal. Here’s a picture of the original recipe. Would you have interpreted the recipe the same way I did? Posted on November 22, 2015 January 26, 2019 by SherylPosted in FoodTagged recipe, sweet potato. Previous Previous post: How Well Do You Treat Your Stomach? I personally hate those overly sweet sweet potatoes mashed with brown sugar and marahwallows on top! I prefer to roast mine after tossing with veggie oil, salt and pepper. This is almost exactly how I’ve done sweet potatoes since I gave up on the marshmallow routine. I bake the potatoes, then mix them well with butter, brown sugar and spices. Then, when it’s time, I put them in a buttered dish, sprinkle chopped pecans and a little brown sugar on top, and bake. The good thing is that it makes sweet potatoes easy to make ahead — always a consideration. Your recipe sounds wonderful, too. I like the idea of adding a few pecans. And, you’re absolutely right–when preparing a big holiday meal, the more dishes that can be prepared ahead of time the better. This recipe sounds like sweet potato pie filling minus the flour and eggs.. I thought ‘Pone” was like corn bread? I’ve never made sweet potato pie, but it’s probably similar. I’m still confused by the name of this dish. The name suggests that it is a cornbread–yet the recipe does not call for cornmeal. Yes, it was confusing to me too! What year was your cookbook printed? I have the 1912 edition. It was originally published in 1907, and then revised in 1912. I think that there may also some later editions. I guess you have a Southern cookbook? It’s out of an old Lowney’s cookbook. Lowney’s was a chocolate company that made cocoa and baking chocolates. The cookbook is a hard cover book and contains over 200 pages with a wide range of recipes. It’s sort of like the Betty Crocker cookbook of its day. This recipe was in a chapter called Creole Recipes. If interested, Check my just posted recipe for potato puree/cheese rolls, that is perfect for Thanksgiving dinner. The orange adds a refreshing touch of citrus to the recipe. It would be interesting to experiment with the amount of butter (and sugar). I checked out your post, and your recipe for potato puree/cheese rolls looks wonderful. I guess it all depends on what you serve it with, but the amounts of butter and sugar do seem quite large. Oh my goodness, YUM!! Can’t wait to try these.. This looks like a wonderful delicious pudding! Yes, I would interpret the recipe just as you did. It sounds really good, will try. It’s nice to know that you’d interpret it the same way. “Translating”” these old recipes can be tricky. Oh this sounds delish, thanks! I hate goopy marshmallow sweet potatoes. I don’t know how that marshmallow topping ever became so popular. I will want to serve this just so I can say “Sweet Potato Pone,”but also it looks delicious. And a good Sweet Potato Pone to you all. I think of a pone as more of a cake than this texture seems to be. But it looks yummy! Sounds wonderful! You have the best twists on the usual recipes! Must try! It nice to hear that you like them. Sometimes the “old” is the new “new”. This looks very tasty! So simple but I’m sure the ginger and orange take it over the top! This dish definitely has a ginger flavor; the orange is more subtle. When I made it, I worried that 2 tablespoons of ginger would be too much, even though the recipe called for that amount. But it turned out perfectly, and I thought that the ginger flavor was just right. I know what you mean. I never tire of eating cherry pie on Thanksgiving. It is a day for family favorites and classics. Great minds think alike. 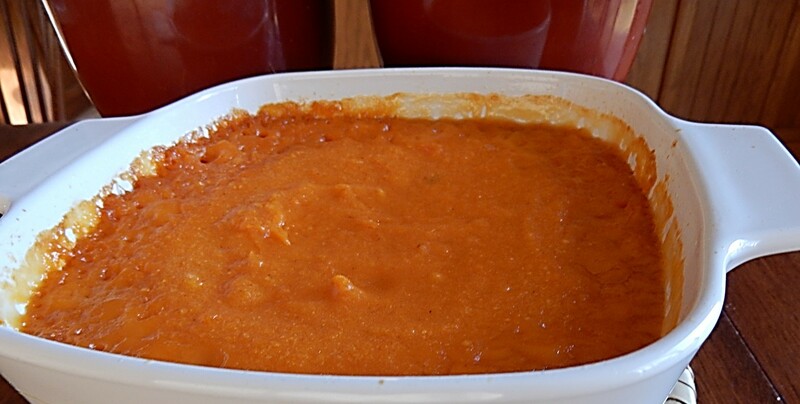 I posted a sweet potato recipe (with NO marshmallows! ), too. This one with ginger sounds wonderful and I love that it came from such an old cookbook. Your recipe sounds wonderful, too. I like how easy it is. I’ve never thought about serving sweet potatoes either of the ways which you and your family enjoy them. I’ll have to try them with gravy. . . and with ranch dressing. I love the idea of searching for a “new” recipe in a 100-year-old cookbook. This recipe looks great. Thanks for researching this. I enjoyed reading what you found. The word pone has a rich history. I like just plain baked and mashed sweet potatoes but my daughter makes the sweet potatoes for Thanksgiving and she makes one pan with marshmallows and one without since she knows I prefer them plain. The pone you made does sound sort of sweet potato pie filling. It’s sweet of your daughter to make one without the marshmallows especially for you. I’ve never had sweet potato pie, but I think that the pone mixture would work well as a pie filling. 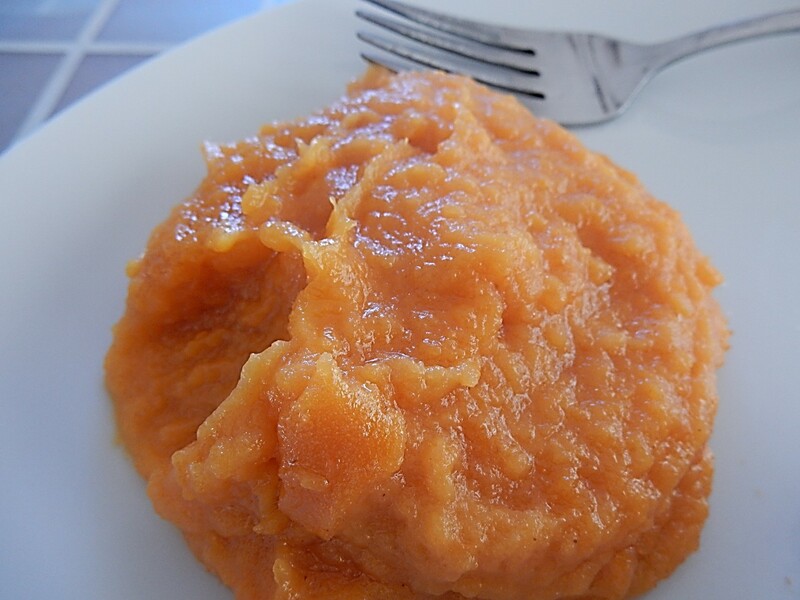 We often mash sweet potatoes with orange juice. The addition of ginger is a great idea. There are several varieties of sweet potato here; some work better with orange juice than others. There are are several varieties of sweet potatoes here, too. Most are orange, but they range in color from cream to almost red. I don’t have much of a sense of how the taste and cooking characteristics vary from one variety to the next. I made this on Wednesday & reheated it yesterday for Thanksgiving. Everyone loved it. The addition of the citrus really sets it apart. I agree with you that it would be interesting to try it with less butter, and sugar (considering how sweet sweet potatoes are!). Thanks for sharing that you made the recipe. It’s wonderful to hear that everyone loved it. mmm. . . this sounds delicious. My Grandmother made one that had orange zest and lemon zest not sure what else but do remember bacon grease on top to make it brown. I sure would like to know what else she put in it. It was great and the next morning she would fry it and serve it with grits. mmm. 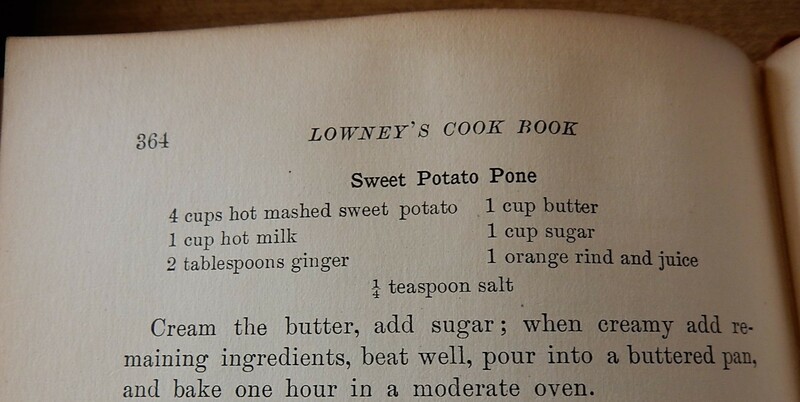 . . your grandmother’s Sweet Potato Pone sounds incredible. I hope that you are able to find a recipe that matches her version. Looks delicious! This is one to try!